Creme Brulee for breakfast? No, I haven’t lost my mind! The custard in this low fat creme brulee is actually Greek yogurt sweetened with fruit preserves on the bottom, and topped with fresh fruit. What a fancy way to serve breakfast or even dessert with very little effort while making you look like a rock star in the kitchen! Perfect for those special occasions or even Valentine’s Day. Other recipes you may like are Chocolate Crepes with Strawberries or Red Velvet Pancake with Cream Cheese Topping. This would be perfect for a Mother’s day brunch or dessert if you’re having a dinner party. Be sure you have enough fuel in your torch and you may want to experiment with one before you making this for a large crowd. This can be made for one or more than a dozen; assemble the preserves and yogurt ahead of time then add the sugar right when you are about to torch the sugar. If you add the sugar sooner, the sugar will be absorbed by the yogurt and it won’t work. I recommend serving immediately. Enjoy!! 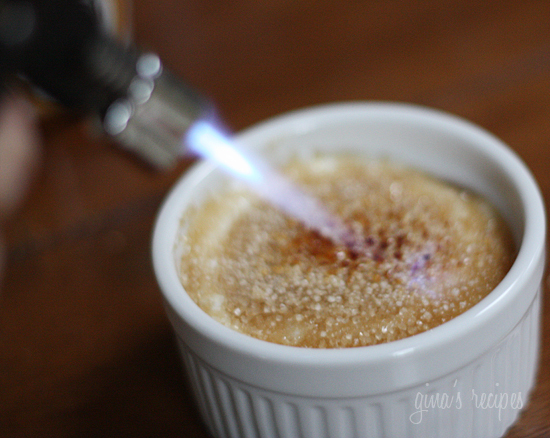 Creme Brulee for breakfast? No, I haven’t lost my mind! The custard in this low fat creme brulee is actually Greek yogurt sweetened with fruit preserves on the bottom, and topped with fresh fruit. What a fancy way to serve breakfast or even dessert with very little effort while making you look like a rock star in the kitchen! 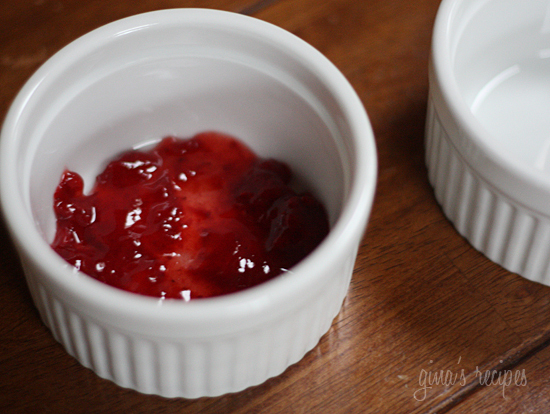 Place fruit preserves at the bottom of a 6 or 7 oz ramekin. Top with yogurt. When ready to serve top with sugar. 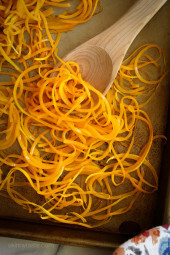 , melt the sugar and form a crispy top. Cool a few minutes then top with fruit. Serve immediately. How do I broil this without the cooking the yogurt? I just tried to make this and by the time the sugar caramelized the yogurt was hot and curdled. My broiler is electric, is that the problem? for the jam — try natures hollow sugar free peach preserves. they're made with xylitol. tastes just like peach pie .. it's amazing. can you use something else besides sugar? This is so great – I made it again this morning. I finally bought a torch and it came up much better! Sure, points would be the same. Can I use regular sugar? And if I do how much will the we pointplus be? Update: Made an oatmeal version – and it was AMAZING. Raspberry preserves on the bottom, and to 1 cup of cooked oatmeal added a chopped banana and 2 Tbsp Better'n Peanut Butter. Assemble per original instructions. Top with a couple of fresh raspberries. Makes 2 servings. PointsPlus: 7 per the recipe builder, 5 per the tracker. Go figure. Just made this for dessert, using low sugar raspberry jam and raspberries on top. It was a little sweet, using the Trader Joe's Vanilla Greek Yogurt. I think next time I'll just muddle a handful of raspberries with a little red wine vinegar to put at the bottom. I'm going to try the Oatmeal one another reader suggested – that sounds great! This was great! I used no sugar added strawberry preserves, and Yoplait Honey Vanilla Greek yogurt. It felt like a decadent dessert! Delicious! Just made this for our dessert! My husband and I love it. I used Honey/Strawberry Greek Yogurt and raspberry sugar on top. Perfection! Great recipe! Wow this is a great idea! You get the look and texture of the dessert but in a healthy way! No, the yogurt doesn't get warm, only the sugar on top. This might be a strange question, but does using the torch make it a warm breakfast? I hope so! How fantastic is this? WOWEE!! Can't wait to try it! THANKS GINA! That looks amazing, we are definitely going to try this soon. 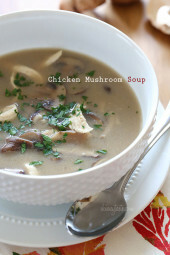 We have shared it with our gluten-free fans on http://www.facebook.com/glutenista too! Hmmm! That looks tasty and yummy! I got hungry when i was about to view your blog. Damn! Thanks for the share! 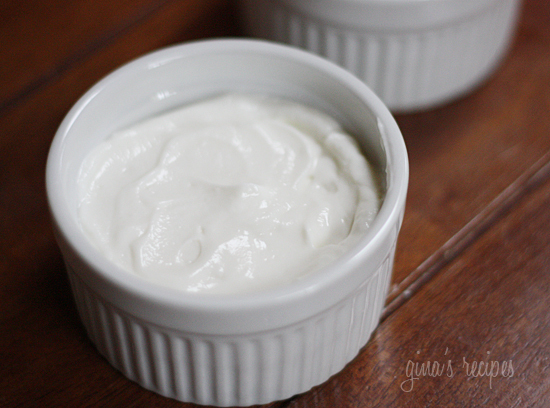 I recommend trying it with the Stonyfield Honey Vanilla Greek Style Yogurt – AMAZING. CHO my goodness! This is incredible. I can't wait to share it with our fans! Aaaah such a wonderful way to start the day. THANKS!! I had the creme brulee for breakfast and the shrimp salad on bagel thin for lunch, bith delicious. People on WW eat well! I just made this for breakfast. It was SO easy and delicious! My 2 year old inhaled it, and was totally impressed with my torchwork! Thanks, Gina! The oatmeal brulee at our restaurant does have jam on the bottom, then a layer of steel-cut oatmeal with dried fruit and nuts, then the brulee sugar crust on the top. No yogurt. It's delicious. I have to try your recipe–it just sounds fabulous. This is an amazing way to start the day! oh gee you got my heart to skip a beat! dessert and practically guilt free! love it! going to make these this weekend! thanks! This is brilliant! I love Greek yogurt and raspberry preserves. Will definitely be putting my torch to use on this soon. Wow — that might get my 12-year old out of the bed in the morning! Great idea. haha, didn't realize you already have vanilla greek yogurt as the ingredient. you're awesome, can't wait to try this! oooh vanilla yogurt would probably be even yummier? I'm sure soy yogurt would work, as long as the yogurt isn't to wet, any yogurt should be ok. I would broil on high close to the flame, keeping an eye on it. A local restaurant does the same thing with oatmeal. Jam on the bottom, brulee on the top. It's fantastic. You are my hero!!! This is brilliant! I'm so into greek yogurt right now, and this looks so good! I can't wait to try it with Marionberry preserves and fresh marionberries this summer! Gina, can you use soy yogurt instead as a non-dairy option? What an awesome idea!! Makes breakfast so much more interesting. dangerous! 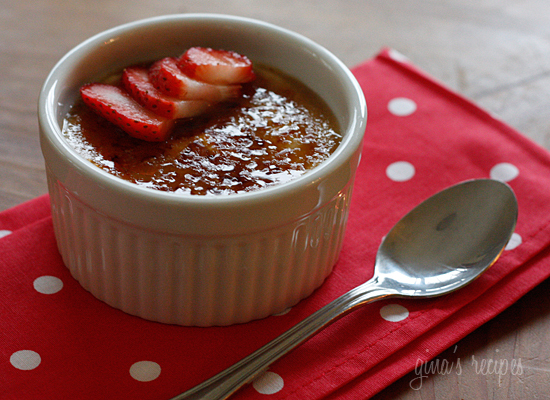 I'm going to have to make this soon- Creme brulee is my favorite dessert! Sounds awesome… my hubby's birthday is coming up and I was looking for something special to make, thanks! 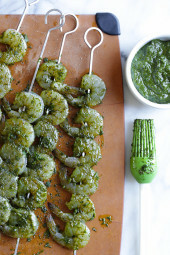 Question… if I was to make this in the broiler would you put it on hi or low and aprox. how far from the broiler would you position the creme brulee? It was delicious, and took me like 5 minutes to make. I'll be making this often! A broiler would work but the torch works better. Where does one find a torch? Any suggestions for a good one that isn't too expensive? Creme Brulee for breakfast sounds like a brilliant idea to me. What a clever idea! Thanks! This looks amazing! I can't wait to try this one out. I love your blog! Brilliant. 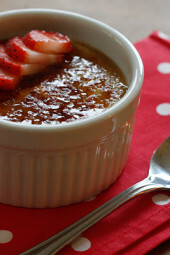 I adore creme brulee, but the typical high-fat custard keeps me from eating it regularly. THIS I could eat every day :). That looks so elegant! I definitely have to try this. 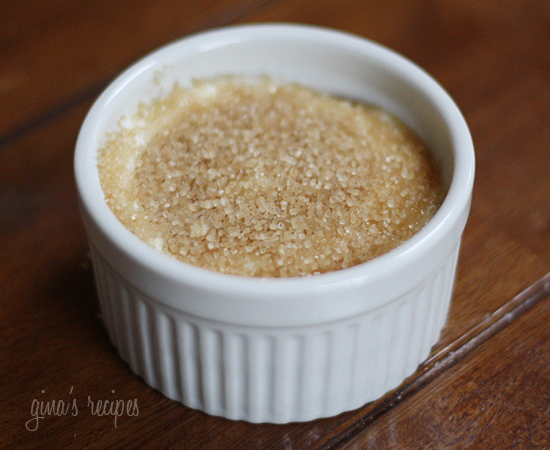 I'm not a fan of real creme brulee (not a fan of custards in general) but I love yogurt and I love, Love, LOVE burnt sugar! Gina, what if you don't have a torch? Can you do this under the broiler?